Do you want to be an architect? Do you want to study architecture? Are you ready to start your path to becoming an architect? If so, consider attending one of the over 150 summer architecture programs [http://archcareersguide.com/portfolio/summer-programs] across the country and abroad. Participating in one of these exciting, hands-on programs is a tremendous way to learn more about architecture as a major, and as a career path. Below are some factors to consider as you research which program may be best for you. Audience: Grad School, High School, College? While many summer programs are intended for elementary, middle, and high school students, there do exist some for college students looking to pursue architecture. Andrews University offers Renaissance Architecture Kids Camp [https://www.andrews.edu/said/renaissance-kids], programs for kids age 5-16. Southern Illinois University[http://conferenceservices.siu.edu/camps-youth-programs/architecture-camp.php] offers programs for students in grades 4-6 (Kids Architecture and grades 7-9 (Middle School Architecture); both are a single week in length. INTROARCH [http://www.arch.iit.edu/study/introarch] is the program of the College of Architecture of Illinois Institute of Technology; the course is designed for those without prior architectural studio experience who are interested in pursuing future architectural graduate studies. 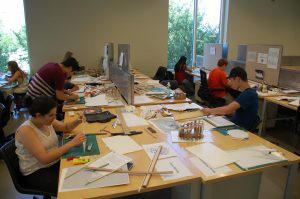 Summer Studies in Constructed Environments [https://www.newschool.edu/parsons/college-adult-constructed-environments]the program of Parsons, is designed for applicants to graduate programs in architecture, interior design, lighting or industrial design. One factor to consider is the length of the program. When you look at the full listing, you will notice that programs range from a week or less to as long as a full six weeks. Many summer programs offered by a college or university provide overnight housing in q residence halls; activities are offered during the evening hours. Some programs are offered only during the day, typically from 9:00am – 5:00pm. Obviously, you would need to reside near the program in order to participate. Architecture and Landscape Architecture Summer Camp, the program at Pennsylvania State University [http://architecture-camps.outreach.psu.edu/] is Sunday thru Thursday, less than a week. Many other programs are a week long, including Auburn University and Clemson University. A critical factor to consider is cost; summer programs will vary in cost. Some programs may cost more than others because they provide college credit. Also, some programs charge a single program fee but that is all inclusive (program fee, housing, food, supplies, etc. ), while others charge only the program fee and other costs are add-ons. Be sure to read carefully and if you have any questions, contact the program directly. Also, be sure to check if there are scholarships and/or financial aid available. Many summer programs offer scholarships plus they may provide financial assistance.